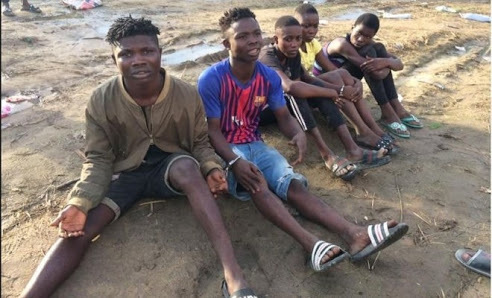 A group of teenagers who reportedly terrorized residents of Sapele, Delta State, were arrested. It was found that the two young boys had rented an apartment in the Gana area of Sapele before the girls with whom one of them went out with them started to live with them. According to reports, teens specialize in burglarizing residents' stores after learning to open the keys with a knife. Reports also indicate that young suspects operate at night when residents have to fall asleep. They were caught recently after breaking into a cassette store and starting their operation. The teenagers were handcuffed during deliberations about what to do for them if they were to be taken to the police station or released.